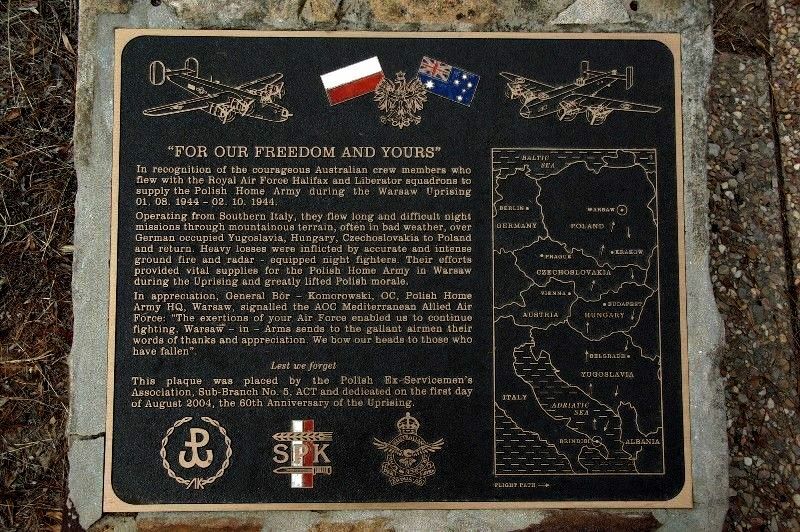 Plaque commemorates Australian crew members who flew with the Royal Air Force Halifax and Liberator Squadrons to supply the Polish Home Army during the Warsaw Uprising in 1944. The Warsaw Uprising was a major World War Two operation by the Polish resistance Home army to liberate Warsaw from Nazi Germany. The Uprising was timed to coincide with the Soviet Union's Red Army approaching the eastern suburbs of the city and the retreat of German forces. However, the Soviet advance stopped short, enabling the Germans to regroup and demolish the city while defeating the Polish resistance, which fought for 63 days with little outside support. According to Janusz Terej, the Uprising was the largest single military effort taken by any European resistance movement during World War Two. "FOR OUR FREEDOM AND YOURS"
In recognition of the courageous Australian crew members who flew with the Royal Air Force who flew with the Royal Air Force Halifax and Liberator squadrons to supply the Polish Home Army during the Warsaw Uprising 01.08.1944 - 02.10.1944. Operating from Southern Italy, they flew long and difficult night missions through mountainous terrain, often in bad weather, over German occupied Yugoslavia, Hungary, Czechoslovakia to Poland and return. Heavy losses were inflicted by accurate and intense ground fire and radar - equipped night fighters. Their efforts provided vital supplies for the Polish Home Army in Warsaw during the Uprising and greatly lifted Polish morale. In appreciation, General Bór - Komorowski, OC, Polish Home Army HQ, Warsaw signalled the AOC Mediterranean Allied Air Force: " The exertions of your Air Force enabled us to continue fighting : Warsaw - In - Arms sends to the gallant airmen their words of thanks and appreciation. We bow our heads to those who have fallen." This plaque was placed by the Polish Ex- Servicemen's Association, Sub-Branch No. 5, ACT and dedicated on the first day of August, 2004, the 60th Anniversary of the Uprising.